Japanese calligraphy is the essence of traditional Japanese culture. Why not try your hand at this art? “Shodo,” or Japanese calligraphy, is artistically written words that are written in a style that is both artistic and emotionally driven. The art of calligraphy was handed down from China during the 6th and 7th centuries, at which time the Japanese learned how to make brushes, ink, and paper. Soon after its introduction, it became an indispensable skill for educated nobles and samurai, the leaders of Japan. Over time, the appreciation spread to the general public. Now, it can be found not only as works of art but also in things such as New Year's cards and other special occasion writings. This art form is now a part of Japanese culture. 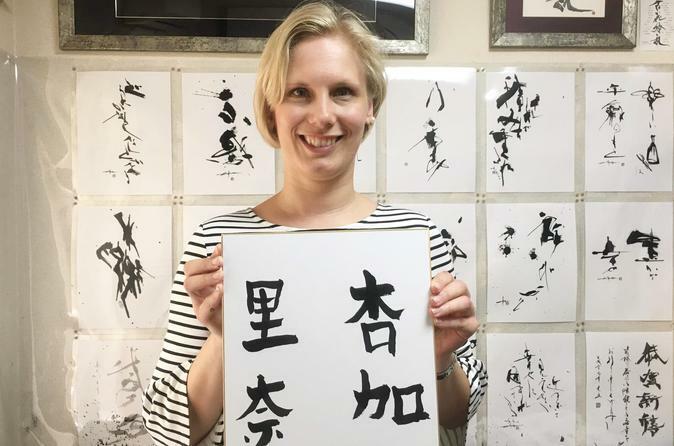 This calligraphy experience, under the professional guidance of the master calligrapher Eikaku Matsumura, will allow you to learn about and then experience calligraphy first hand in a traditional atmosphere suited for this contemplation and quiet reflection conducive to the art of Japanese calligraphy. Mr. Eikaku Matsumura, known for his elaborate and ingenious style, is an extremely well-regarded and is in high demand in advertising, television, and other fields. Due to his fame, he was also a part of the 2011 film "1,778 Stories of Me and My Wife,” where he provided professional guidance to the singer and actor Tsuyoshi Kusanagi of SMAP. Even as a famous calligrapher, Mr. Eikaku Matsumura is a charming and approachable master who is sincerely eager to facilitate a unique and memorable Japanese experience for you!